How invincible is Kevin? What's the deal with Australia? 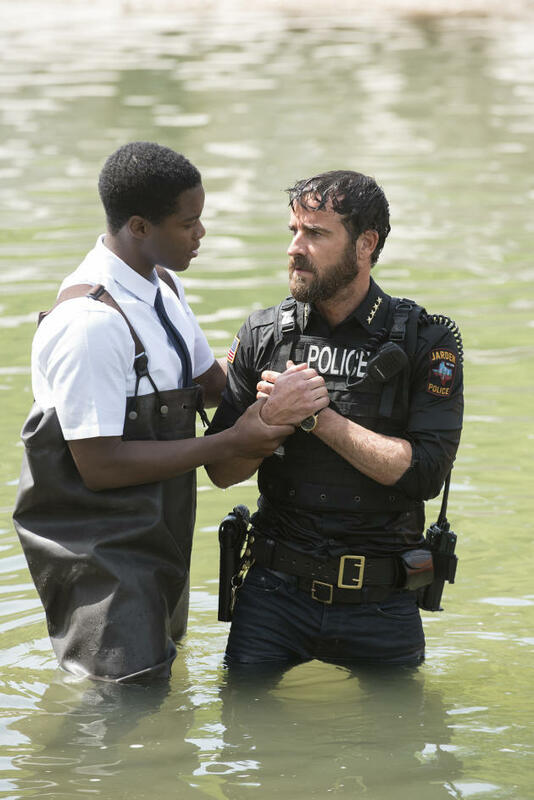 The larger tensions at play in the kick-off to the third season of HBO’s pseudo-apocalyptic drama, The Leftovers, are all about paranoia surrounding the seventh anniversary of the Sudden Departure. As such, it’s leaving fans with a ton of questions about where the final season might lead. After a humorless first season, the second season went on to course-correct, delving further into the bizarrely supernatural while remaining utterly bewildering all the same. The status quo seems to be holding after a brilliant premiere. Kevin submitted to a baptism, but does he need it if he can already rise from the dead? Kevin sort of died twice in Season 2 — once by poison and another by a gunshot to the gut. While either one may or may not have actually killed him, each occurrence led him to visit a mystical-seeming Hotel for a short time before reviving and/or waking up. He also tried to drown himself only for an earthquake to save him. In “The Book of Kevin,” he takes a dip in supposedly poisoned water and lives to tell the tale. Later, his crazy former dog-hunting buddy, Dean, tries to shoot him only for Tommy to save Kevin at the last second. There are some resurrection elements at play, and Kevin sure as hell seems damn lucky much of the time. As Matt suggests, it surely seems like Kevin, “can’t die here in Miracle.” What will that mean if Kevin makes his way to Australia? Can he even die at all? Is he not sure and that’s why he tries suffocating himself? That sure as hell looks like an older Nora, but why would she hide her identity? Was That Nora at the End? The very end of the episode saw a gray-haired woman calling herself Sarah in Australia that looked exactly like a noticeably older Nora. A nun asks her if she knows anything about a “Kevin,” to which she says no. What gives? If this is some sort of flash-forward featuring Nora, what is she doing hanging out with nuns on a different continent? Why is she hiding her real name? Why is she denying any connection to Kevin? The last time we saw Erika was on that bridge. Where the Heck Is Erika? The last time we saw Erika Murphy in the Season 2 finale, she was on the bridge leading into Jarden when the Guilty Remnant swarmed the bridge and forced their way into Miracle. She disappeared into the crowd, perhaps to never be seen again. In the Season 3 premiere, she’s still nowhere to be seen, and her ex-husband is married to someone else. She’s not even mentioned by any of the characters. Are we ever going to see her again? Is she even still alive? Who knows? Why Does Kevin’s Closet Look Like His Hotel Closet? One astute redditor noted that the closet we see in the Season 3 premiere looks like the “choose your own adventure”-type closet that Kevin has when he’s in the Hotel dreamscape in “International Assassin.” Is that the show subversively trying to make us question the nature of the reality being shown? “Can holy balls be busted?” Nora wonders. We don’t know, but maybe The Leftovers will answer that as it airs Sundays at 9 p.m. Eastern on HBO.